It was a golden opportunity to take full control of the series. The key word there is “was”, because that opportunity is now gone. 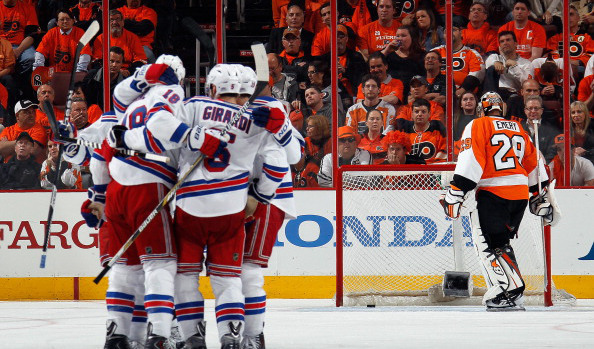 After a disappointing 4-1 loss to the Rangers in Game 3, the Flyers now trail the best of 7 series 2-1. What was supposed to be a chance to take a commanding lead in the series is now essentially a must-win game when the Flyers and Rangers return to the Wells Fargo Center ice on Friday night for Game 4 of the Eastern Conference Quarterfinals. The Flyers top line of Claude Giroux, Scott Hartnell and Jakub Voracek was quiet (again), Ray Emery wasn’t good and the officials were just plain terrible. Things started out fine. The Flyers had the crowd on their side and came out hitting. Comcast Sportsnet Philadelphia Flyers reporter Sarah Baicker even tweeted that the Wells Fargo Center was louder than Madison Square Garden was for games 1 and 2 in New York. Then Ray Emery misplayed the puck as he went to glove it which allowed Derek Stepan to give the Rangers a 1-0 lead. Fans were hoping that the Flyers would respond with a vengeance and answer with a goal of their own, but unfortunately it was all downhill from there. It was another slow start for the Flyers and more frustration from Flyers fans. Adding to that frustration was the questionable, and sometimes flat-out awful, officiating by the referees. Sometimes referees will keep their whistles down by their sides and sometimes the whistle never get lower than their neck line. This was much more of the latter. After a Martin St. Louis redirection that Emery couldn’t do anything about gave the Rangers a 2-0 lead, the Flyer finally got on the board late in the first period when Jake Voracek found a streaking Mark Streit who snapped it by Henrik Lundqvist to make it 2-1. Long story short, that was as close as the Flyers would get. A Dan Girardi blast from the point in the second period made it 3-1 Rangers. New York added an insurance goal halfway through the third period in the form of a familiar foe when former Flyer Dan Carcillo beat Emery five-hole on a break away to make it 4-1. Former Flyer Dan Carcillo’s third period goal was the final nail in the coffin for the Flyers in Game 3. This was a golden opportunity for the Flyers to gain serious momentum in the series and they let it slip away. Their habit of giving up the early goal reared its ugly head again and it cost the Flyers dearly. It didn’t help that the defensemen looked slow on the counter rush trying to stop the Rangers attack. The Rangers are a good team at home and seemingly even better on the road. Beating them is not easy, but it’s doable. One of the things they need to do is get better shots on goal. The Flyers had 32 shots on goal in Game 3, but had only one goal to show for it. The Rangers had 28 blocked shots in the game, which made difficult for the Flyers to get pucks through to the guys down low in front of the net. If they can keep the shots low, that makes the Rangers block the shots with their skates instead of their skin pads. Not only is it more painful to block a shot with your skates, which makes it a long night for shot blockers, it creates opportunities for odd bounces and loose pucks for garbage scorers who like to set up in front of the net, like Wayne Simmonds, to pounce on. The other thing that will help greatly is simply being more disciplined. It’s been said millions of times, but it’s huge, especially in the playoffs. As I said before, and I speak for both teams, the referees were awful in Game 3, and have been pretty bad all series for that matter. That being said, it’s important to be disciplined enough to not do anything that is even remotely close to a penalty. It’s understandably hard when the refs are calling every little thing, but it can be done. At any rate, Game 4 is Friday night. After the Game 3 loss, Flyers captain Claude Giroux was adamant that the Flyers would be ready on Friday and will tie the series. The bottom line is if they want any kind of good chance at winning the series, then they better win Game 4.